The restaurant, Villas Mombacho, overlooks the lake and the views are of the many little islands and the local fishermen at work. Distant volcanoes fill the horizon and my friends and I are surrounded by palm trees and flowers. We typically spend an hour or so each afternoon here enjoying a cold drink. The restaurant is just five minutes from my home. One of the reasons I chose Granada was its walkability. I walk everywhere and at night might take a taxi, which is 40 cents door-to-door anywhere within the city. The city center is only a few minutes from my house, as is the main market, and there are many cafes, restaurants and shopping areas nearby. In fact, my day starts with a walk. I take my dog, Tyson, to the park, and when I get back, I might do a work out before having some breakfast of local fresh fruit and home-made bread. The rest of my morning is usually spent painting in a nearby art gallery and studio. Then, lunch at home, or at a nearby cafe with a friend. In the afternoon, I’ll probably spend a few hours on the computer writing, raising money for the library project I’ve founded with friends. A weekday evening is usually quiet. I walk Tyson down to the lake, make some international calls via Skype, cook a dinner with fresh produce from the market, water the garden and hit the sack early. Weekends there are plenty of things to do: there’s always a party or a dinner, there may be music at a local club, and occasionally we head to the capital Managua to see an opera or concert. It’s only 40 minutes away. Unlike many other North American expats here, I originally arrived from Asia, where I had been working. So I had a bit of a headstart in terms of adjusting to life overseas and coping with a new culture. My needs were specific: I wanted to live in a small, tropical colonial city where I could get around without a car. I wanted to buy an affordable house with a big garden. And I needed to be in a country that was close enough to the U.S. that I could be “on call” for my aging parents. I rented for about four months before buying a large lot close to the Central Park and building my house. During those first months I met a number of expat residents and Nicaraguans, many of whom have remained friends to this day. In fact, the ease of meeting people was probably the key factor in my decision to stay. After building my house I began renting out rooms for some income. Then I bought a small house to rent out long term. I have also taught yoga, translated, worked on websites and done art work. And I’ve founded a children’s library/educational project with friends. The cost of living depends on your tastes. My monthly expenses are around $1,200 and I live comfortably. Medical and dental treatment here is excellent and cheap. Many doctors are U.S. trained, and the Hospital Metropolitano in Managua is certified by the International Joint Commission. For those considering a move to Nicaragua, or any other country for that matter, my advice is to rent for three to six months before uprooting yourself entirely. Talk to as many expats as you can and get their advice and different points of view. Make a list of pros and cons, and identify your needs and wants. 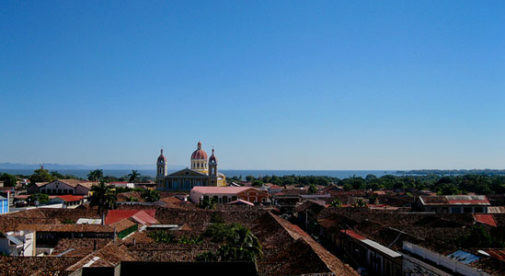 When I first came to Nicaragua almost 10 years ago, Granada was a sleepy place with a slim selection of hotels and restaurants. Now, the country is a top colonial retirement destination, it ranks third on the New York Times’ list of places to visit in 2013, and has been rated as the number one “Emerging Destination” by Wanderlust Travel. The rise in tourism, the growing expat presence and retiree population, and foreign investment over the past few years has been markedly visible, especially here in Granada. Things have come a long way.